When missionaries first arrived in Japan in the 16th century, they presented Christian theology with European trappings. They also encouraged Japanese converts to abandon their native culture and adopt Western ways. As a result, Japanese authorities suspected that the converts were foreign agents and unleashed a brutal persecution, driving any converts who survived into hiding. While Christianity returned to Japan under new laws of religious freedom in the 1870’s, it has always remained the faith of a tiny minority. The novelist Shusaku Endo became a Catholic as a child. In the second half of the 20th century, he wrote a series of novels, struggling to reconcile this religion from Europe with his Japanese identity. He once described Catholicism as a symphony rather than a solo. He said that it could only be a true religion if it found room for a Japanese contribution. His major novels, Silence and The Samurai, are major efforts to discover that Japanese contribution. This icon uses Japanese symbols for compassion and enlightenment to describe the person of Jesus Christ. Jesus sits on a glorious lotus blossom, in the posture of a bodhisattva, just as in ancient Greek icons he is depicted in the robes of a philosopher like Plato or Aristotle. 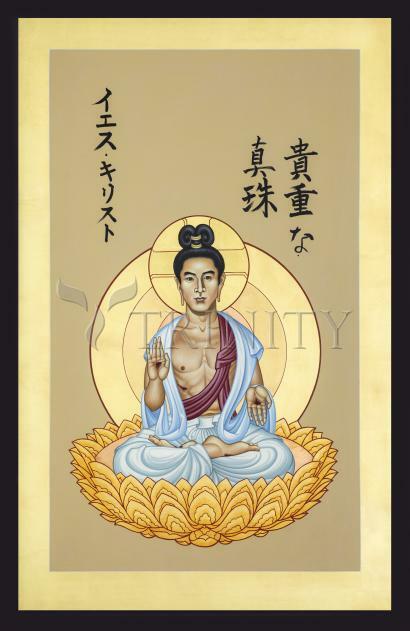 As the Greek artists made no effort to depict Jesus as a Palestinian Jew, but made him one of their own, so he is depicted here as a Japanese man. As they freely gave him attributes of Greek gods and Roman emperors, without fear of adding him to the pantheon of another religion, here Buddhist attributes surround Jesus, with no intention of making him Buddhist. The inscription on the left side of the icon reads “Jesus Christ.” That on the right reads “The Pearl of Great Price.” Jesus and his Gospel are the pearl of great price for all of humanity. Just as we translate the words of the Gospel into other languages, so we must find ways to describe Jesus, the Word himself, with symbols that make sense to non-Europeans.